Vesuvianite, also known as Idocrase, represents cooperative effort and as such, it is a wonderful stone to present to newlyweds, business associates, friends and acquaintances. It can be useful when needing to clear negative and/or repetitive thought patterns from the mental and emotional bodies. Once these thought patterns have been cleared, the mental/emotional bodies will stabilize. Use it to remove/release pent up anger and fears. Calmingly it acts quickly, yet gently to help find balance when the emotions are in turmoil. 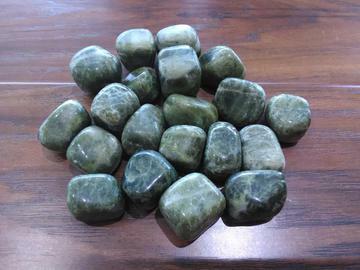 Vesuvianite helps to connect the Heart Chakra with the spiritual realms, accessing the higher self and its connection to Source, which is love. This stone strengthens teeth and bones; aides in nutrient absorption; alleviates skin ailments; may increase one’s sense of smell.